Looks like it’s going to be sugary! 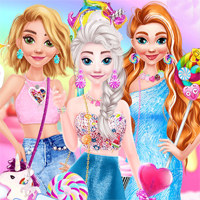 Come join your favorite princesses Elsa, Anna and Rapunzel in this brand new game called BFFs Unicorn Party!Test your creativity and design the best Unicorn themed party! Make sure you have lots of fun with this amazing dress-up game!